WTF!!!! I can hear you guys scream from over here. Don’t worry, we had 2 meals at Michelin star places in Hokkaido so there’s lots of good food write-ups coming up. This was actually our very first meal in Japan. We were on the way to our ryokan (traditional full service Japanese inn) so we didn’t want to spoil our appetite since we had a complete kaiseki (multi course formal Japanese dinner) due in a few hours. 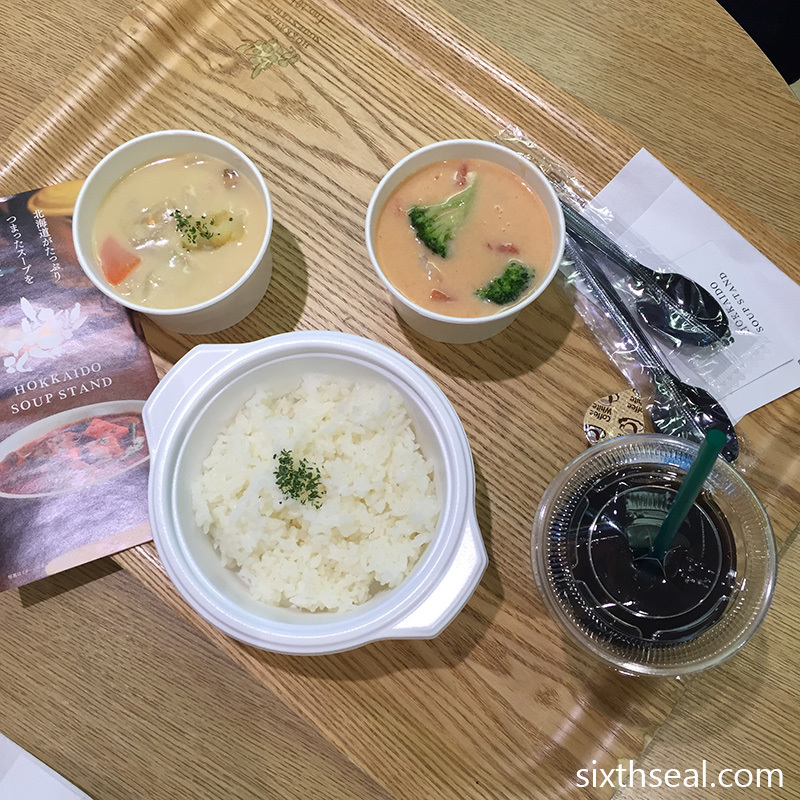 Thus, we decided to grab something light to eat at New Chitose Airport while waiting for the shuttle to pick us up. My better half wanted to eat soup so we came here. Personally, my choice was beef tongue, very popular in Japan, but she doesn’t like beef. I can eat just about anything and I was very happy with the Hokkaido in the title so here we came. This was my order. You can have it by itself for JPY 530 (S) or JPY 690 (M) and I opted for the smallest size since I didn’t want to ruin my appetite. You can have Set A (Hokkaido white rice, sprouted brown rice, circle bread of Hokkaido wheat + one drink) for JPY 380 extra or Set B (just one of the 3 starches, no drink) for a JPY 160 supplement. I opted for the full set and went with Hokkaido white rice (200 grams) and an iced coffee. The rice was nice and fluffy and came locally so that was delicious. 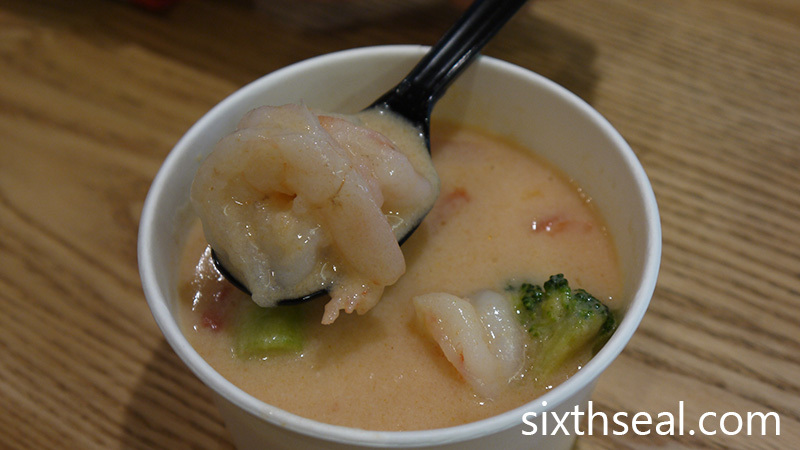 The real star was the huge and juicy shrimps though. It was my first preview of the wonderful and abundant seafood available in Hokkaido and I fell in love right away. It went very well with the organic tomato soup base with cream. The cream is local too, Hokkaido is a big dairy producer. RM 22 for a soup seems a bit steep but the prices here are actually decent if you don’t convert. 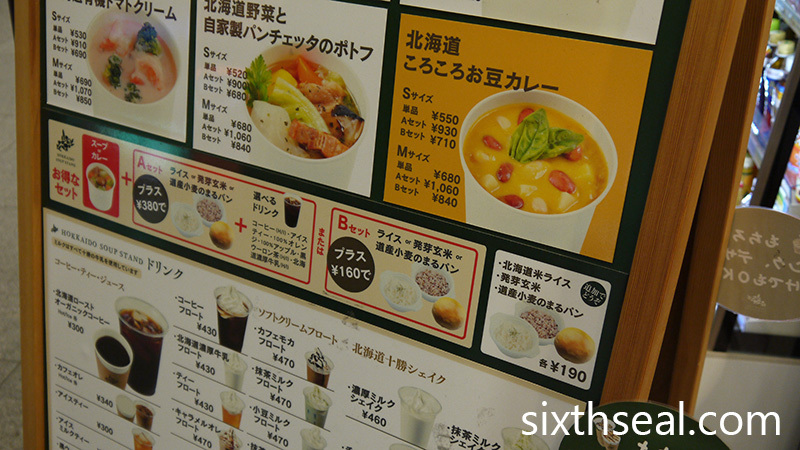 A regular meal per pax is usually around JPY 2,000 (RM 85) so it’s best not to convert. Haha. It’s a good thing I brought a fair amount of yen so we could eat whatever we wanted. The pork here was decent and the soup tasted good enough but I preferred mine. My dear had this and shared my rice. 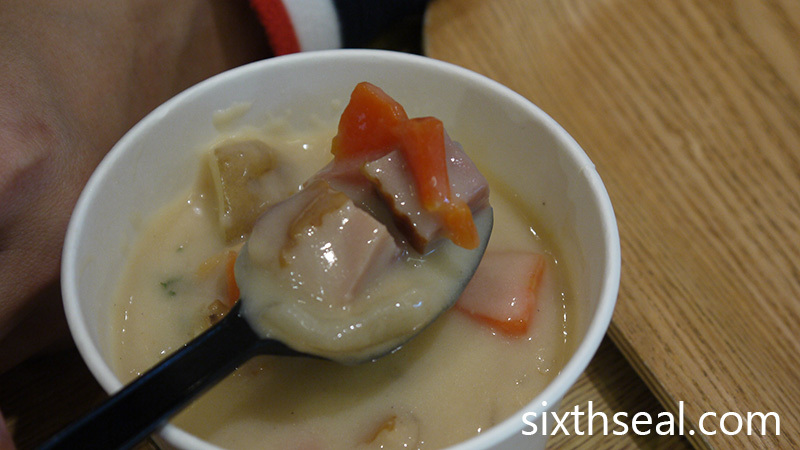 Piping hot soups are absolutely perfect for cold winter days…but I tend to go to the washroom a lot after that. Probably too much. LOL!!! I’m usually not big on soups but my dear wanted them, probably for the same reason, it was quite jarring as soon as we got to Hokkaido since the temperature difference between Malaysia (30 degrees Celsius) and Sapporo (-11 degrees Celsius) is so extreme it took a while to acclimatize. Both soups are the creamy type. Looks ok. I prefer the one with prawns. Enjoy! Stay warm. Thus, they put a lot of cream into their soups. The cream is delicious though and surprisingly the best mango lassi we had was in Sapporo. HAHAHAHA It was soooo thick and creamy and made with Hokkaido milk and cream that it flows like lava. I love creamy soups! I don’t fancy (red) tomato sauces or soups, but if creamy ones like in the picture, I don’t mind trying.. I prefer your cabbage & pork creamy dish, it actually looks like chowder in the picture.. I do like creamy soups though, same as you. It was so hard to find out what was what at first so we had to guess most of the time. However, there is better technology now, you can actually take a photo of the Japanese words and Google will try and translate it for you. wow.. I agreed with STP. Hot soups just nice for super cold weather there! I like a bowl too! Warmed us right up after drinking it. I would prefer a hot bowl of ramen noodle or even shabu shabu. Just like you said, a humble meal to comfort both tummy is totally not a bad idea afterall. We just ate this for fun coz we didn’t want to eat too much. We had a big kaiseki dinner later and didn’t want to ruin our appetite. 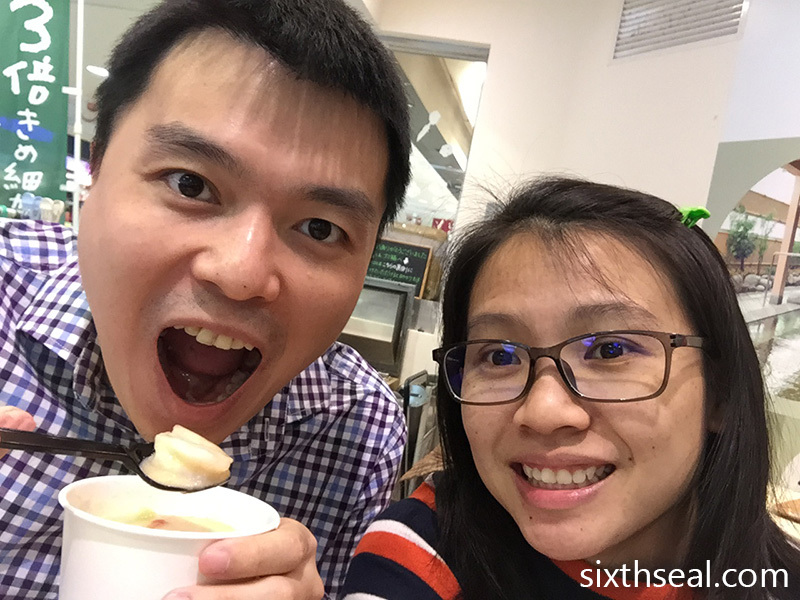 We ate ramen twice too – once at a remote Michelin listed place. It was the best! We wanted something savory to eat but didn’t want to eat too much for fear of spoiling our appetite so this fit the bill perfectly. Thus we ate here coz it was the right thing to eat at the right time. It was quite decent though, perfect for a winter’s day. I just like seafood personally. I’m very big on seafood, I’ll usually choose fish and shellfish over most meats nowadays. This wasn’t always true, I didn’t like fish growing up, while I loved chicken and pork. I still do but I like fish more now. 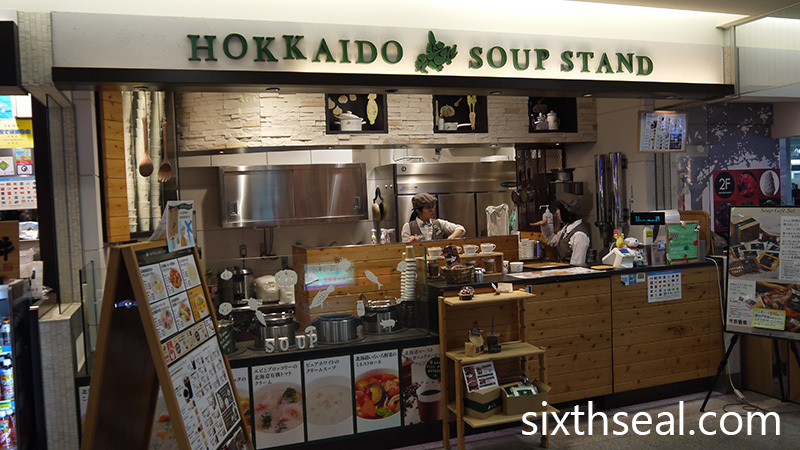 This must be Hokkaido’s equivalent of Tokyo Soup Stock. Nothing like hot soup on a cold winter’s day! I think soup places wanted to take off around 2012 or so. They were big in London at the time too and I saw them spreading in Australia too. It was good for winter days and people on a diet liked them coz you could eat less calories by drinking soup + eating bread or white rice. It didn’t really take off though but there are a couple of places around.